OK. So there is acne and there are breakthrough products for getting rid of acne. And then there are acne scars. Acne scars are the reminder of the acne we had in the past and can be just as frustrating and embarrassing. Luckily there are ways to reduce scarring from acne and even techniques to eliminate it. But, if your looking for an answer to “how to get rid of acne scars overnight”, well the answer might be just as frustrating as the scars themselves. There really is no way to “get rid” of acne scars overnight. It just can’t be done. At least not with current technology. However, you can conceal them quickly, temporarily, while you treat them slowly for a more long term solution. Some people are lucky and the scars that are left by their bouts with acne are superficial and will eventually fade away. Other people struggle with scars that are much deeper and that are not so easy to get rid of. The type of scarring that you have will play a large role in how quickly you can get rid of it. If you have the type of scars that are mostly superficial and that will eventually fade away, you have several options if you really want to get rid of acne scars fast. There are many different medical procedures, such as laser treatment, some home remedies, usually an herbal salve or infusion, and even some makeup tricks that will accomplish the goal that you have. When choosing a treatment plan to get rid of these types of scars it is best to choose something that will not cause any more damage. It is not that difficult to turn a scar that can be easily dealt with into something that is much more permanent and that will require more extensive treatments. There are ways to deal with scars that are deeper and more permanent. Most of these treatments involve medical procedures and some of these procedures will have to be done multiple times. They are not usually something that can be done to clear up the acne scars overnight. If you are looking for a way to clear up these permanent scars overnight, you will usually have to settle for something that is temporary and that will not do much more than cover up and conceal the scar. Just like the treatments for superficial scars, be careful about how you treat your permanent scars or you could be left with more problems than when you started. That still leaves us the question of how to get rid of acne scars overnight. There are different treatment options that can either conceal the scars, that can fill the scars so that they are not visible, or that can possibly remove the scar all together. It may be necessary to try different treatments as not all of them are guaranteed to work with your particular skin. The first line of defense for people who suffer from acne scars is makeup. There are many products that are made to help conceal the scars. If your scars are very superficial it is not difficult to conceal them with makeup. The help of a professional cosmetologist might help you learn how to apply the concealing makeup in the best ways so that it looks natural. The downside of using cosmetic products is that they are not going to get rid of acne scars permanently. They will only hide them, not make them go away. However, this could be the solution you are looking for. If you are in need of getting rid of acne scars fast, make up is a great remedy. Also keep in mind that some of the concealing products can also be the same products responsible for the clogging of the pores of your skin that gave you acne in the first place. Look for products that are designed to be non-acnegenic, or non-glog forming. These are better to use for people who are trying to get rid of the acne scars. The next step for many people is to try to fill in the scars. Derma fillers can help make the scars disappear immediately. These derma fillers can be collagen base so that not only will the scars disappear, it is possible that new and healthy skin growth will be stimulated. This will help make the scars disappear permanently. There are two ways to apply derma fillers to acne scars. One is through injections, usually performed at a skin treatment clinic. This process involves injecting the filler into the different layers of skin to “fill-in” the scarred area and can be very effective. However, there are factors that make this solution not too appealing. These include multiple trips to and from the clinic, costs (injections can get expensive), the treatments are not permanent, and the fact that you are injecting a foreign substance into your skin. The other option is via derma filler topical creams. These creams are primarily for filling in wrinkles, but can be effective on acne scars. They work by boosting collagen and elastin production to help firm and tighten the skin. Again these are not permanent fixes, but they are far better that injections. Please note, filling the scars will not work for everyone. The more serious and deeper scars might not be able to benefit as quickly from these treatments. The derma fillers are often only a temporary solution. Most of the time the injections will have to be repeated until the scars heal on their own. 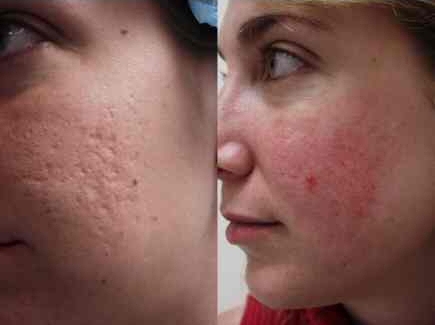 One more idea for how to get rid of acne scars fast is through the use of laser treatments. Unlike other medical procedures that treat the scars by peeling away the top layers of skin and sanding away the scars, the lasers work by opening the scars up underneath the skin. This type of treatment can permanently remove the scars. The speed of the process will depend on the depth and severity of the scars. If the scars are superficial it could be possible to take care of them in a single treatment which only takes a short visit to a skin clinic. For deeper scars it will take multiple treatments over a much longer time span to remove the scars. For those who are not interested in, or have concerns about lasers and injections, there are a number of home remedies that have been shown to get rid of acne scars. However, these will not be a treatment path that will work quickly, and definitely not overnight. The remedies tend to be a combination of herb and spices that are applied to the skin in the form of a home made cream or paste. Keep in mind, there are many home remedies that can help you learn how to get rid of acne scars, but not all of them will work. You might end up disappointed, especially if you expect the scars to be gone overnight. Most people are better off with a product that has been proven to work or with the help of a professional who has the experience needed to get the results that they want.